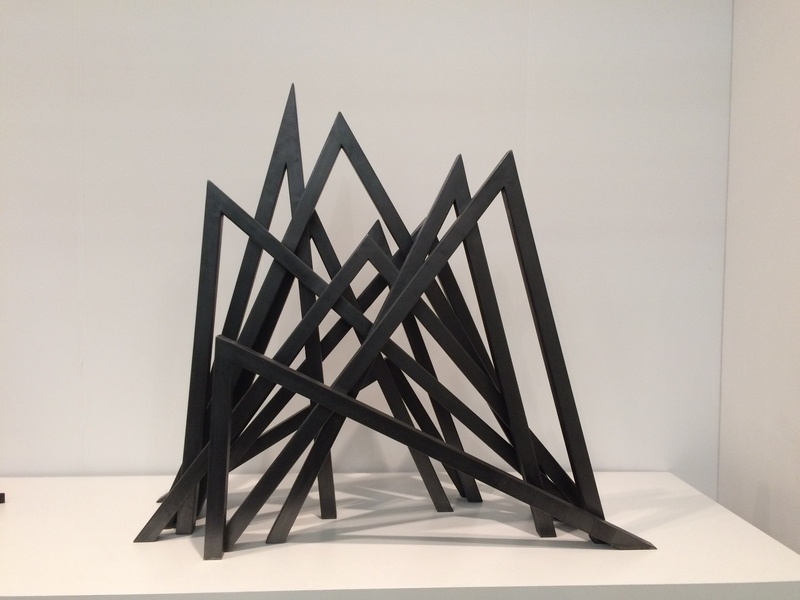 The largest of all of the Art Fairs in New York City last week was the Armory Show that was on two huge piers (92 and 94) on the Hudson river. A wide range of work was exhibited, I have just chosen a sampling of more recent work with Mathematical themes. I was still in line to check my coat when I spotted Bernar Venet’s steel sculptures across the aisle. 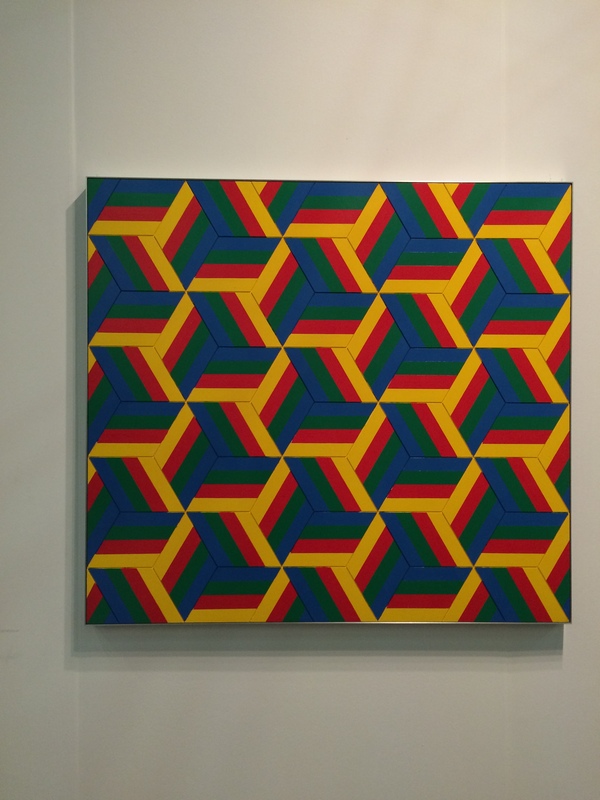 The title of the work above, “11 Acute Unequal Angles”, is a perfect description of the geometric theme of the work. It is always exciting to see work that so directly embraces the mathematics. This next work, by Shannon Bool, is a large- scale oil and batik on silk. The fabric is slightly transparent and backed with a mirror which creates an interesting repetition of the design, as well as a slight ghost of the reflection of the viewer. Through the use of grids and diagonals, there is a reference to the geometry of architecture. 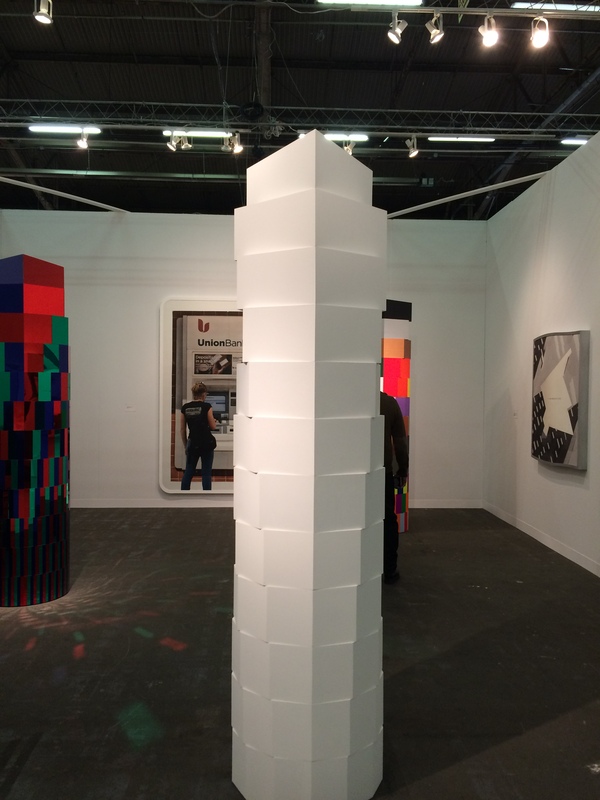 This eight foot tall painted plywood column by Brandon Lattu consists of 12 stacked prisms. Each prism has a regular polygon as its base. The top form has is triangular, the second is square. The third one has a pentagonal base, and so on. Each subsequent prism has bases with one extra side. The prisms are stacked in such a way that a vertex from each prism lines up to create a vertical line. When you walk around the structure you can see the different angles. 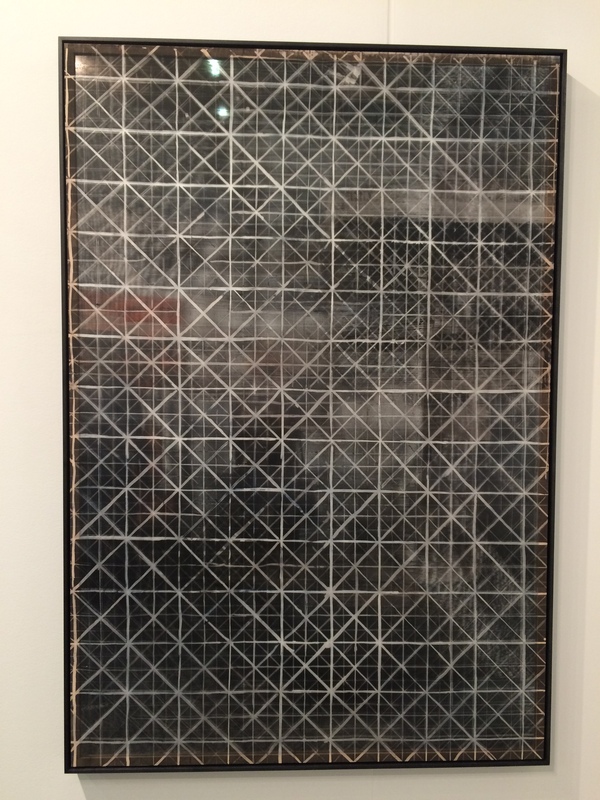 This work is a great visual example of a numeric progression in terms of the number of sides in each section. It also compares the different angles found in regular polygons. 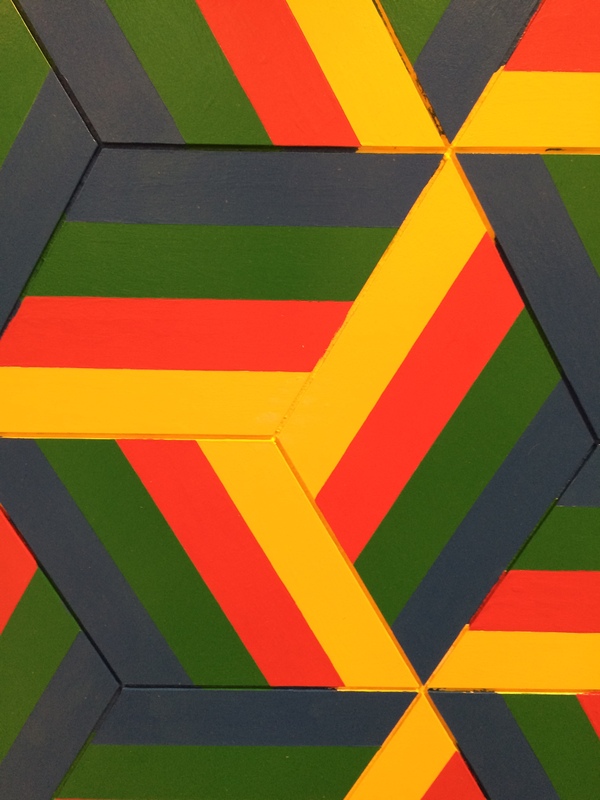 Jim Iserman’s acrylic painting is a pulsating homage to hexagons. This work is made like a tiling. Each hexagon is created using three rhombi. By situating the yellow bands to meet at the center, Iserman creates a Y-pattern. The forms take on the presence of cubes jumping off the surface. 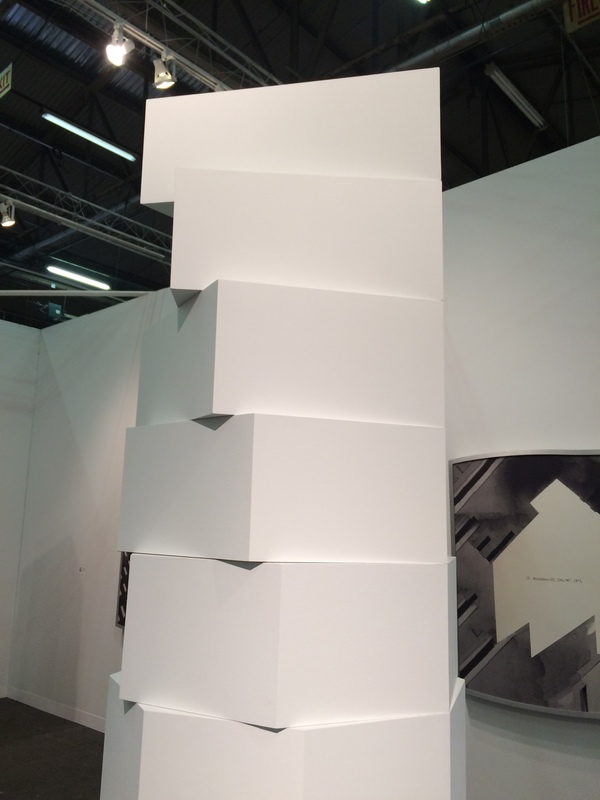 The Armory show is an overwhelming experience. It takes hours to even get a superficial overview. There were a myriad of other works of art that relate to mathematics at this venue. It was difficult to chose just a few.